On a recent Sunday morning, Chicago police Superintendent Eddie Johnson gathered press and top brass to announce that every patrol officer in the city would be equipped with a body camera by the end of 2018. The price tag, Johnson said, would be $8 million. But police officials now acknowledge, after repeated inquiries from The Chicago Reporter, that $8 million doesn’t even cover the first full year. The long-term cost will actually be much higher: By the time every officer on the force is outfitted, the Chicago Police Department will spend more than $6.5 million each year on the body camera program, according to a CPD analysis provided to the Reporter. Those millions will be spent on a product for which there is still little research supporting its effectiveness in curbing police misconduct, despite increased interest in body camera programs across the country. A 2014 study funded by the Justice Department looked at the available research on body cameras and found that most of the claims made by supporters—that body cameras reduce use-of-force incidents, civilian complaints and civil lawsuits—are unsubstantiated. “Police departments should be cautious and deliberate in their exploration of the technology given the lack of research,” wrote Michael D. White, the author of the study and a professor of criminology at Arizona State University. Instead, Chicago, which has the second-largest police department in the country, acted with speed and urgency. Within days after the release of the Laquan McDonald video last November—before he fired his police superintendent or established a task force on police accountability—Mayor Rahm Emanuel announced an expansion of a body camera pilot program, which had started almost a year earlier with 30 officers in the Shakespeare District on the Northwest Side. It was the first policy announcement by the Emanuel administration after the video of Officer Jason Van Dyke fatally shooting 17-year-old McDonald sparked mass protests, calls for police reform and demands for the mayor’s resignation. Less than two months later, Emanuel signed a five-year contract worth up to $10 million with Taser International, the stun-gun giant that is now the nation’s largest body camera manufacturer, to provide the cameras for more than 2,000 officers in seven police districts. In government procurement, two months is lightning speed. To quickly make good on the mayor’s promise, the Emanuel administration used an obscure procurement method called “piggybacking,” which allowed it to skip the standard competitive bidding process and overlook two other companies, including Chicago-based Motorola Solutions. Piggybacking allows a jurisdiction to rely on another jurisdiction’s contract for the same product or service. Taser International has been criticized by experts and competitors for encouraging no-bid contracts in police departments around the country. The contract locks Chicago into using Taser International’s cloud storage software, Evidence.com, for at least five years. 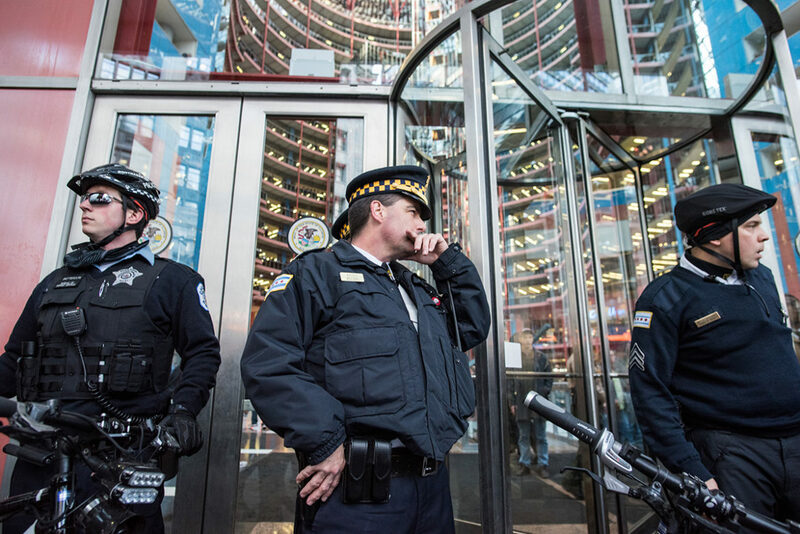 By then, CPD could be storing hundreds of thousands of hours of video, making it difficult to switch if the company were to raise the price or the department were to find cost savings in storing the videos on local servers. Under the contract, Chicago will pay Taser International $78 per officer per month for a body camera bundled with Taser’s trademark stun-gun, plus unlimited storage on Evidence.com. At that price, not including the increase of 500 patrol officers that Emanuel has promised, the total cost over the first five years could exceed $30 million. A spokeswoman for the Department of Procurement Services, which oversees city contracts, said Chicago got a better price on the body cameras and storage than any other department that has signed with Taser International. (The Reporter couldn’t confirm this claim.) She also said the DOJ, which gave CPD $1 million for the body cameras, approved the contract. Ald. Brian Hopkins, 2nd Ward, who attended a presentation on body cameras by Taser International last month, said he wasn’t familiar with the details of the contract, which did not require City Council approval. He said time will tell if the investment in body cameras will be worth it. Some of those same words were used in the grant issued by the Justice Department last year that sent nearly $20 million to more than 70 law enforcement agencies across the country, including $1 million to CPD, to implement or expand body camera programs. The DOJ has since doubled down on that effort with $20 million more in body camera grants. But there is little evidence so far that body cameras actually achieve any of those lofty goals. An early and oft-cited study in Rialto, California found that body cameras reduced citizen complaints by 88 percent and use-of-force incidents by 60 percent. But the tiny Rialto Police Department, with 54 officers policing a population of about 100,000, is hardly comparable to Chicago, with more than 12,000 officers and about 2.7 million people. A more recent study by the RAND Corporation and researchers at the University of Cambridge of more than 2,000 officers across eight departments in the U.S. (including Rialto) and the United Kingdom also found that body cameras seemed to cause a significant drop in complaints. But they also found the effect of body cameras on use-of-force incidents depended on whether officers decided when to turn on their cameras. When officers followed the protocol, which requires them to record every stage of every interaction with the community, those wearing cameras used force 37 percent less often than those without cameras. But during shifts when officers used their discretion, use-of-force actually rose 71 percent. Experts say when police officers fail to turn on their body cameras, it can undermine trust. That was true in Chicago in July when an officer shot and killed 18-year-old Paul O’Neal, who was unarmed, after he crashed his car into a police vehicle and ran off. The officer was wearing a body camera but didn’t turn it on until after the shooting. CPD’s body camera policy requires officers to turn the cameras on for all foot and vehicle pursuits, as well as most other police-civilian interactions. O’Neal’s family has sued the city and the officers involved. In a typical government procurement, particularly for a highly technical product like body cameras or video storage systems, a city issues a request for proposals (RFP) detailing the goods and services it needs and any desired specifications. It then compares the proposals on quality and cost and selects the best deal. According to city policy, the superintendent has to justify the use of a reference contract in a memo to the chief procurement officer. But the procurement department would not provide that memo or other documents related to the contract to the Reporter, saying they were exempt from disclosure under the Freedom of Information Act. It is important that government contracts, especially high-profile ones like those for police body cameras, be transparent, said Mike Purdy, a government procurement expert in Seattle who worked for two decades in various contracting roles. “Everybody should know: How did they go about this? How was the price determined? Did everybody have a fair shake at it?” he said. Chicago turned to an odd choice for a piggyback: the State of New Jersey, which signed a contract with Taser International for Tasers in 2011. In December 2013, New Jersey added body cameras and Evidence.com subscriptions to that contract. But there is no record that New Jersey conducted a competitive bid specifically for body cameras, and a spokesman for the New Jersey Department of the Treasury declined to answer questions about the matter. But Purdy said New Jersey’s contract with Taser International “troubled” him and might not have been appropriate for Chicago. A reference contract can be appropriate, he said, when it is recent, covers the same products and is for a similar quantity of goods and services. New Jersey’s contract seems to fit none of those qualifications, he said. The contract was three years old when Chicago piggybacked on it, and it was for an indeterminate quantity of goods and services from Taser International. According to Kwiatowski, Chicago negotiated a lower price with Taser International than New Jersey. But that doesn’t mean it couldn’t have gotten an even better price—or a better product—by competitively bidding the contract to multiple companies, Purdy pointed out. Taser International was one of the earliest companies to enter the body camera market, in 2009. As demand for body cameras soared after the shooting of Michael Brown in Ferguson, Missouri in August 2014—a shooting in which there was no video—Taser International came to dominate the market, in part by encouraging cities to use non-competitive contracting processes, according to the Wall Street Journal. As of April 2016, Taser had been awarded contracts in 23 of the 26 largest local police departments that had chosen a body camera vendor, according to the Journal. Ten of those were done without bidding. Steve Tuttle, a Taser spokesman, denied that the company encourages piggybacking or no-bid contracts. Taser has also come under fire for hiring retired police chiefs to lobby their old employers. In Chicago, former police Superintendent Terry Hillard was a registered lobbyist for Taser from 2006 to 2015. He lobbied the Police Department on behalf of Taser’s body cameras throughout 2015, according to city lobbyist disclosure forms. The forms don’t specify the nature of the lobbying and Hillard could not be reached for comment. He said Taser International was chosen because no other company could bundle body cameras and Tasers. Yet if the goal was to bundle body cameras with other products already in use by the department, other options existed. Coban Technologies, the company that makes the dashboard cameras for police vehicles, and Motorola Solutions, which makes the department’s two-way radios, both manufacture body cameras that sync with their other devices. Guglielmi said the department “looked at” other vendors, but wouldn’t give names or say how they were tested or evaluated. He said the pilot program was aimed at determining whether CPD wanted to continue with body cameras at all, not at finding the best hardware or the best video storage solution. The department appears to have made up its mind about using body cameras. But others aren’t so sure. Ald. Hopkins said he hopes body cameras will ultimately decrease the number of lawsuits against the Police Department, for which Chicago has paid out more than $210 million in the past four years alone. Sorry, but your rejection of the Rialto study is meaningless. Do you even understand statistics? What about the size differnce makes that an invalid study? And it seems that the RAND study explicitly contradicts you, so long as the one apparently significant variable as to choice of activation is accounted for. Your reporting is dishonest.